﻿ Vajrasattva Mantra - 100 Syllable Vajrasattva mantra and short Vajrasattva mantra. My article The Hundred Syllable Vajrasattva Mantra has been published in the Western Buddhist Review, vol 5. Vajrasattva is pure white in colour and is sometimes known as the Prince of Purity. His name means "Adamantine Being", or more poetically "Embodying Reality". He is a member of the Vajra family of Akṣobhya which also includes Vajrapāṇi. He is depicted as a young man in the prime of life, with all the silks and jewels of a wealthy prince. In his right hand he delicately balances a vajra at his heart. In his left had he holds a bell at his waist. The vajra represents Reality, and Compassion; while the bell represents Wisdom. In some mandalas Vajrasattva represents the Ādibuddha or the Primordial Principle of Buddhahood; in others he changes places with Akṣobhya in the East. In Shingon Buddhism it is Vajrasattva that passes on the initiation of the Dharmakāya Buddha Mahāvairocana to Nāgārjuna, thereby creating the Vajrayāna lineage. In the mūla-yogas the practitioner carries out a set of four pactices 100,000 times. One of these is visualising of Vajrasattva and repeating his 100 syllable mantra 100,000 times which helps to purify the karma of the person intending to go on to the tantra proper. Completing these practices is seen as essential prior to receiving initiations or ordination in some Tibetan lineages. and chanted FWBO style by Jayarava. Vajrasattva is associated with the hundred syllable mantra, the chanting of which is used in rituals of purification especially funerals (see below). There is also a short version of the Vajrasattva mantra. We'll start with the short mantra. 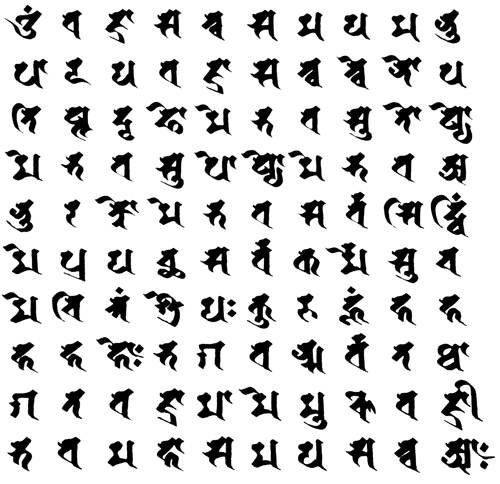 Below is the Vajrasattva mantra in Tibetan Unicode - you might need a special font to see this. I use Tibetan Machine Uni to create the Uchen images, Office 2000 also comes with Microsoft Himalaya. O being of the great contract be a vajra-bearer! The Sanskrit version of the 100 Syllable mantra follows the edited text of the Sanskrit produced by Jayarava in his article: The Hundred Syllable Vajrasattva Mantra. Western Buddhist Review, Vol. 5, 2010. The English translation is my own. The basic mantra ends with āḥ. Hūṃ and phaṭ are traditionally added under specific circumstances - hūṃ when the mantra is recited for the benefit of someone dead, and the phaṭ when the mantra is recited to subdue demons. They are not present in the Tibetan example above, however in the WBO/FWBO they are routinely included because this is the form of the mantra that Sangharakkshita received from Dudjom Rinpoche. See also - Examples of the Vajrasattva mantra in Lantsa and Uchen. Selections on Vajrasattva by Sangharakshita from Free Buddhist Audio. Original faces: Reflections on Purification - by Dharmacari Saccanama.